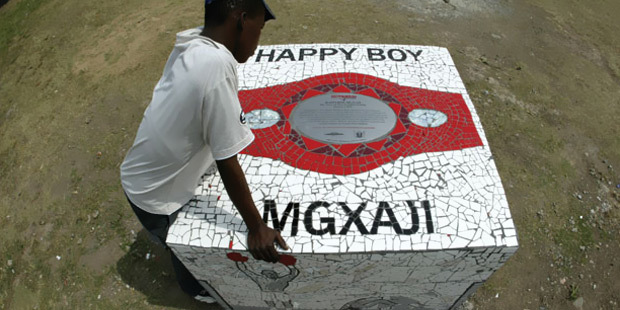 Andrew Lindsay and Luyiso Makipili’s memorial honouring Eastern Cape boxing legend Happyboy Mgxaji is installed at the Sisa Dukashe Stadium in Mdantsane, where huge crowds gathered to witness his timeless boxing style. 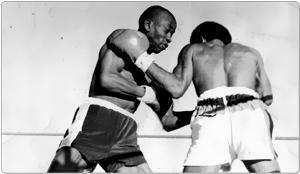 On September 2, 1972, Nkosana "Happyboy" Mgxaji, Mdantsane's first great boxing hero, beat Durban fighter Moses Mthembu in a non-title fight at Sisa Dukashe stadium, which was half-built at the time but was the only venue that could accommodate the huge crowds Mgxaji attracted - black boxers could not use the bigger venues reserved for whites. Mgxaji, who won the SA Junior Lightweight title in 1973, inspired generations of champions, many of whom grew up fighting in front of huge crowds at this 20 000-seat stadium. Mdantsane and Duncan Village have produced at least 14 world champions and 46 South African champions. Tracing Happyboy Mgxaji’s early years to his life as one of the most respected boxers in the country, the Daily Dispatch published this article in 1976. In an article written at the end of the last millennium intended to "honour the ordinary people who gave us meaning and entertainment", Xolela Mangcu gives a full history of Mxgaji’s rise to boxing stardom. Having got into boxing because he had to defend himself on the mean streets of Mdantsane, Happyboy Mgxaji went on to fight his way to glory. In this letter to the Sunday Time Heritage Project, former Mdantsane resident and Happyboy fan Daphne Fanie recalls how her family used to huddle around the wireless in their two-roomed house "just to hear him win". Who are Loyiso Makilipi and Andrew Lindsay? Johannesburg artist Andrew Lindsay and a group of emerging artists developed the Mgxaji artwork from a concept by Mdantsane artist Loyiso Makilipi. Artist Loyiso Makilipi had the rare opportunity to spend time with his subject while he worked on the memorial honouring Eastern Cape boxing giant Happyboy Mgxaji. "I wanted to fight, that's all." In this lesson plan, learners will see that sports writing forms its own genre. Writers adopt a special sort of humour because they are writing for readers who expect to get a sense of pleasure from the articles on the sports pages. Learners will begin to realise that there are different kinds of written sources, often shaped by readers' expectations!